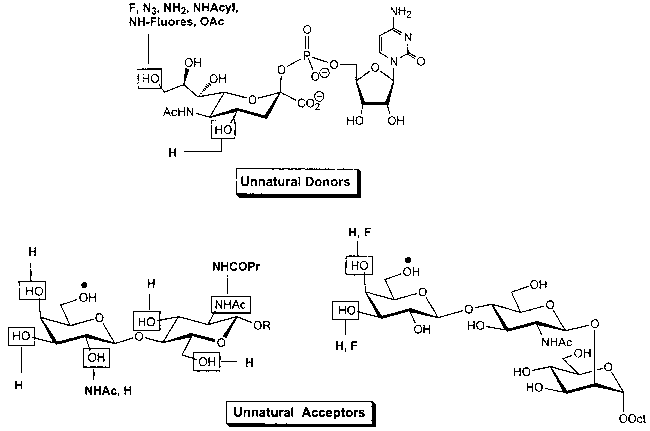 Figure 16 Unnatural donors and acceptors for «2,6-SialT. o reactions. The only practical differences between chemical and enzyme catalysts are that enzymes are generally sensitive to temperature, pH, and shear. The most critical parameter for using an enzyme in synthesis is defining the quantity or activity of enzyme that will be added to ensure that the reaction goes to completion. This amount should first be determined in a defined standard kinetic assay and then with the substrate that will be employed in the reaction. The amount of enzyme activity is defined by units (U), where one U of enzyme activity is the amount producing 1 ^mol of product per minute. Substrate and product inhibition are frequently observed in enzyme catalysis; therefore it is desirable to carry out a full kinetic analysis by varying substrate concentrations and determining the Vmax (maximal rate of reaction at saturating substrate) and KM for the substrate. This analysis will show whether substrate inhibition occurs at high concentrations that would reduce the reaction rate. As well, by estimating the rate of reaction at a given substrate concentration, the time required for completion can be estimated. A standard assay can also be used to check the viability of the enzyme catalyst throughout the reaction by removing a small aliquot from the reaction mixture and assaying for remaining activity in a standard assay. Water is the usual reaction medium for enzymes; however, organic solvents or cyclodextrins can be added to increase the solubility of poorly soluble compounds. While multienzyme donor recycling systems can be used for in situ donor production [12,19], the following examples utilize stoichiometric donors.